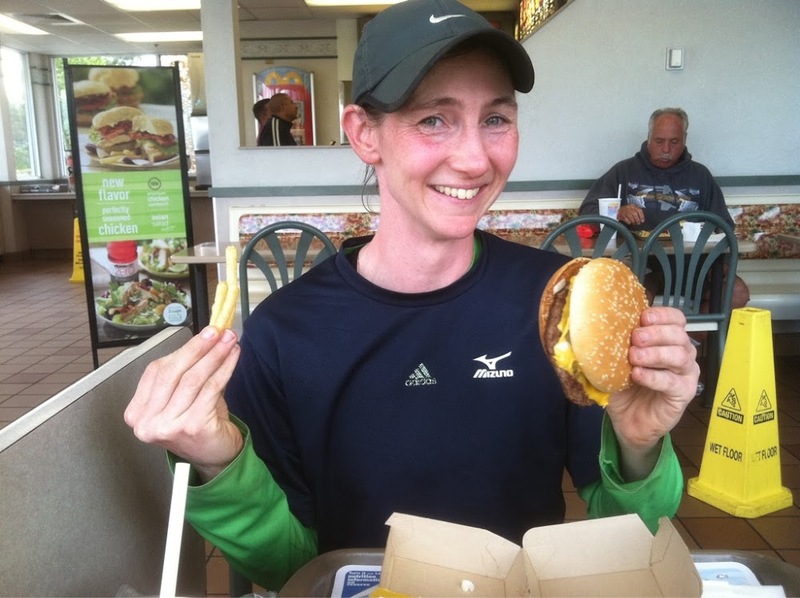 Day 20: I'm Lovin' It! The day started with us both oversleeping. Neither one of us slept much during the night. The winds were high all through the night and it rained a bit. It calmed by the time we got going, but it looked like rain all day and was pretty cool. I wore my rain pants for the first time this trip in the morning and it was nice to have them with the wet plants and periods of mist. We had periods of mist, but nothing significant. More rainbows, which was nice! 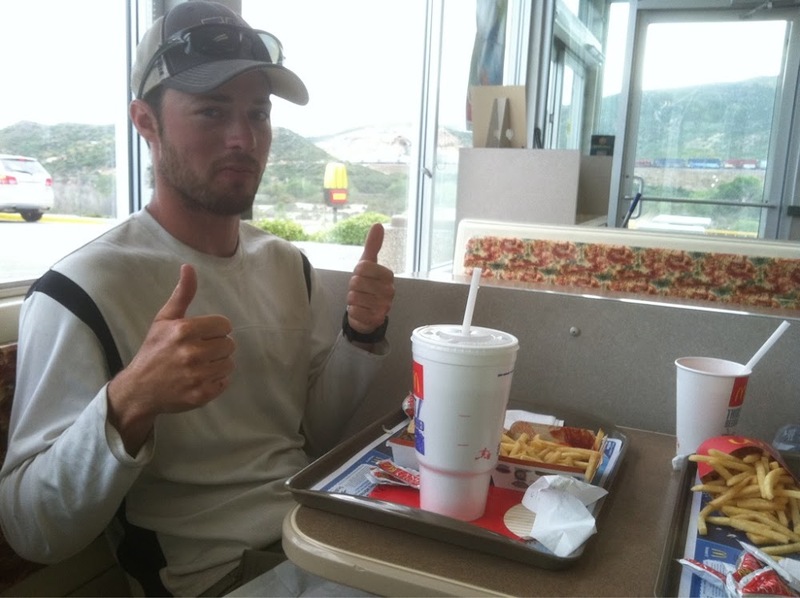 The goal of the day was to make it 27mi to the “on trail” McDonalds at Interstate 15. We were already starting off 40min late and we were worried about hiking that far and finding a campsite without exhausting ourselves. We knew tomorrow would be uphill pretty much all day and we didn’t want a McDonalds breakfast before a long climb. We decided to set a good pace early and see what we could do. Both of us were feeling strong, and for the first time, like we had hiker legs. We had a great stride going and got 13mi done before noon. We still don’t have anyone we know around us and we passed many couples today who were hiking a slower pace and started well before kick off. We sat down at a road to check the map and a car drove up and the woman said, “Hey hiker trash(a term of endearment on the trail)! I’m setting up some trail magic at the pavilion down the road.” We couldn’t believe the coincidence of us being there at just the right time. We hesitated because that wasn’t in the schedule and then we realized there is NO WaY we could pass up trail magic. The trail angel was named Shepherd and she had it all! Thank you Shepherd! I had 2 hot dogs, two Swiss Rolls, hot chocolate, and BBQ chips. The hiker hunger has finally hit me! While we were there, the other hikers we had passed in the morning showed up. Stumbling Goat, Thumper, Guardian, Angel, Kristen, Eden, and General Zad. They are all really nice, kind people who we wish we could hike more with. 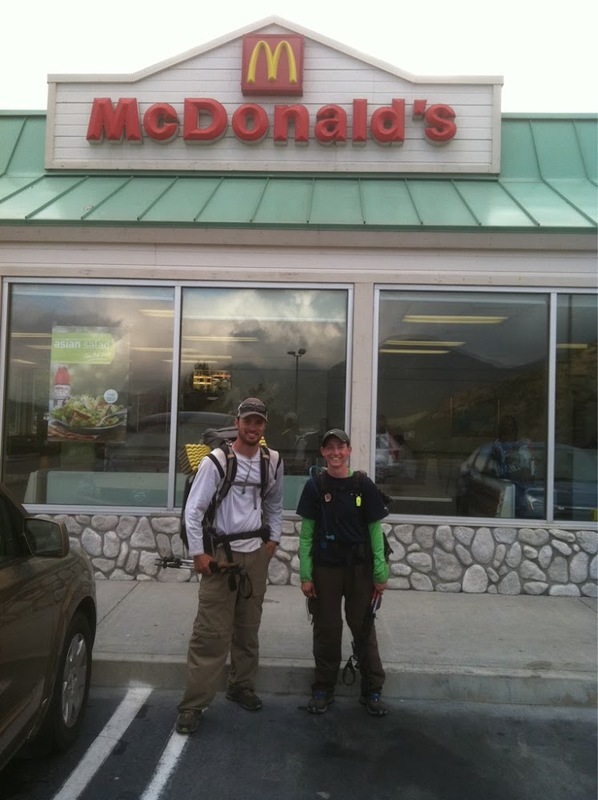 We found out that some of them were also headed to McDonalds and that the Best Western near it has a great hiker rate. Hmm, another night in cold windy tents, or a nice bed with a shower and hot tub? We decided to treat ourselves to the hotel! We cruised the next 13mi to McDonalds and the hotel and were there by 5pm. We couldn’t believe we got there so quickly including the unplanned break. I ate a McDonalds burger for the first time since high school. I actually had a quarter pounder, a double cheeseburger, fries, and a milkshake! Yep, definitely got the hiker hunger! We finished the night with a much needed hot tub visit. We got to talk more with retired thru hikers Guardian and Angel. After California, they are going to jump up to Canada and hike south, so we’ll see them again in Washington or Oregon. That will be really cool! We’re sleeping in tomorrow and doing a shorter day with lots of uphill.